This may just be my favorite two tone paint project. The color combination is perfect. Linen and off-white go together like peanut butter and banana. How are you guys today? Wasn’t it a great weekend! 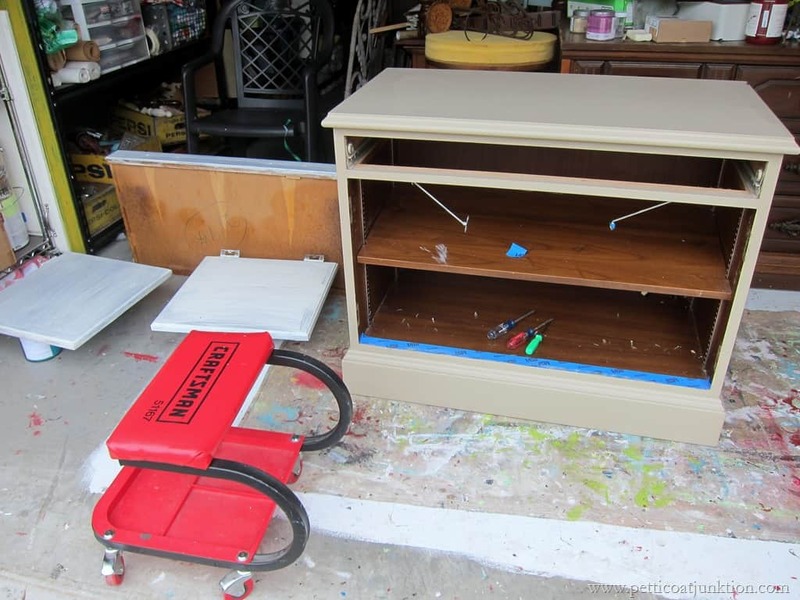 I made it out to my shop and actually painted a piece of furniture….shocker. Bet ya’ll thought I forgot how. 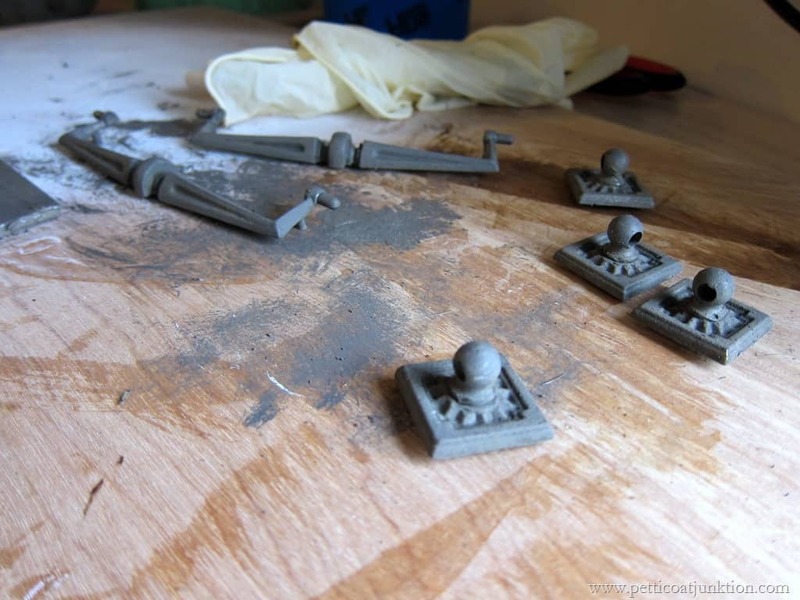 It’s a nice solid piece manufactured by Hoosier Desks. That’s what’s stamped in the drawer. Now I know it’s not a desk but what would you call it? I removed the doors to paint them. I really hate to do this because sometimes they don’t go back on right. I tried to paint them without removing them but that was a pain. I ran into stripped screws and misaligned magnet door thingies. I’m telling you guys…it takes 2-3 times longer to prep a piece than it does to paint it. I painted the handles for the drawer and bought some fancy knobs at Hobby Lobby for the doors. I purchased 3 sets of knobs because I didn’t know which ones would work the best………and because they were all cute! None of them worked….I mean….they looked ok…but not what I was going for. 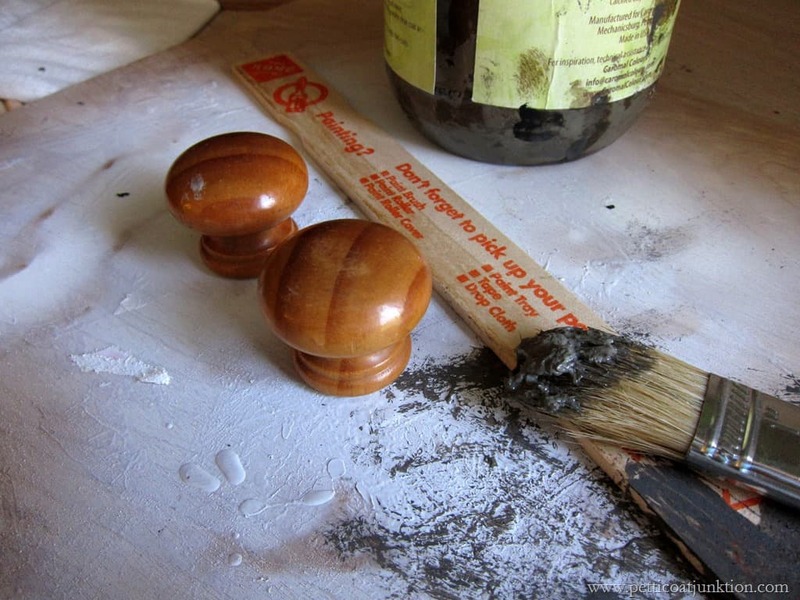 I found a couple of wood knobs and painted them to match the drawer handles….a flat grey/brown special paint mix…by me. 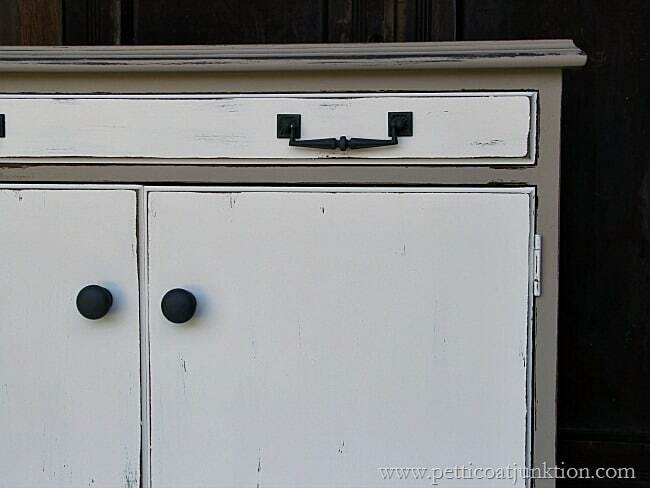 The furniture casing is Beyond Paint in Linen and the doors and drawers are Beyond Paint in Off-White. The knobs and handles are dark and they really pop against the off-white. 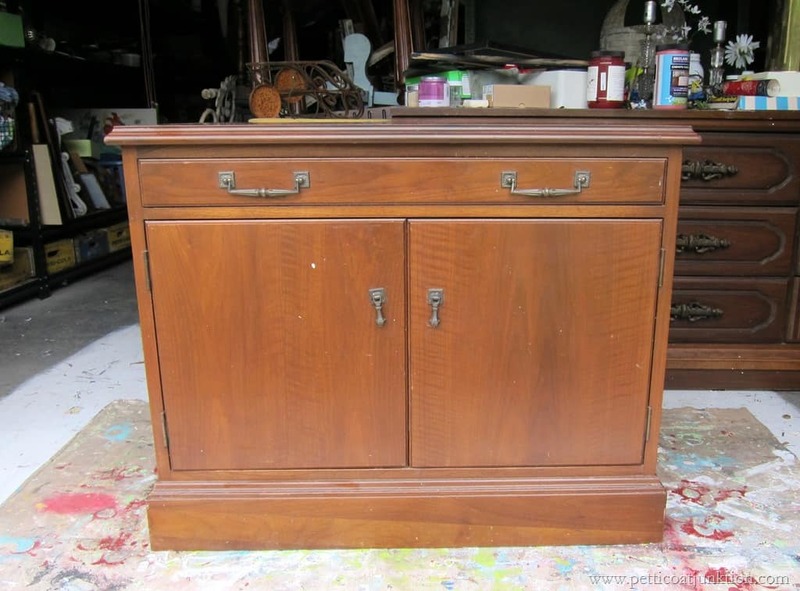 After the handles and knobs were put back on, the foyer chest was all ready to go….but it didn’t look right. I told the JTS I was going to distress it. He agreed that it needed distressing because it was too……something….. I’ve brought him over to the dark side. He had an appointment in the cardiac department at the VA last Friday and the nurse told him he could drive, mow the yard with the riding lawn mower, and not go fishing. Making progress. Do you like the Reclaim paint project? Visit the Petticoat Junktion Amazon Page for my favorite DIY Paints and Supplies. I hope you didn’t take my comment in a negative way. I have always liked your work and have been following you for a couple of years now. I have also learned a lot form you as well. Thank you for sharing your wonderful work. Debra, I didn’t take it negative at all. I understand that everyone doesn’t like heavily distressed furniture. One of my best friends doesn’t like it at all! 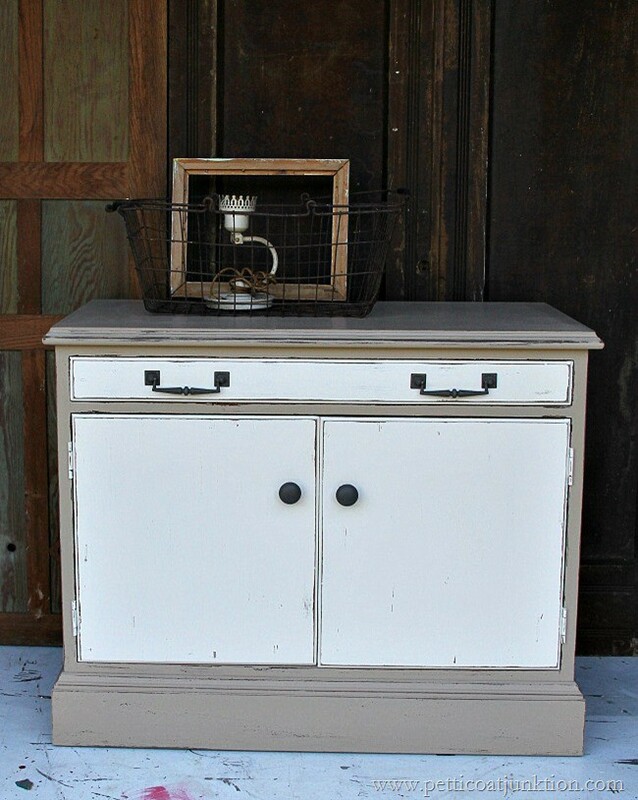 I’m sure you will be seeing a lot more distressed furniture from me along with non-distressed. Thanks for reading the blog. I love sharing little tips and techniques. Love your work. Take care of you and your Veteran. Thank him for his service! Sheryl that is so sweet. I love the Righteous Brothers too! You have a magic touch when it comes to knowing how to paint furniture. Beautiful job on the pi am glad your hubby is getting better. I am so glad you had a creative day. Sorry for possible dumb question- what is Reclaim paint… A brand name latex? 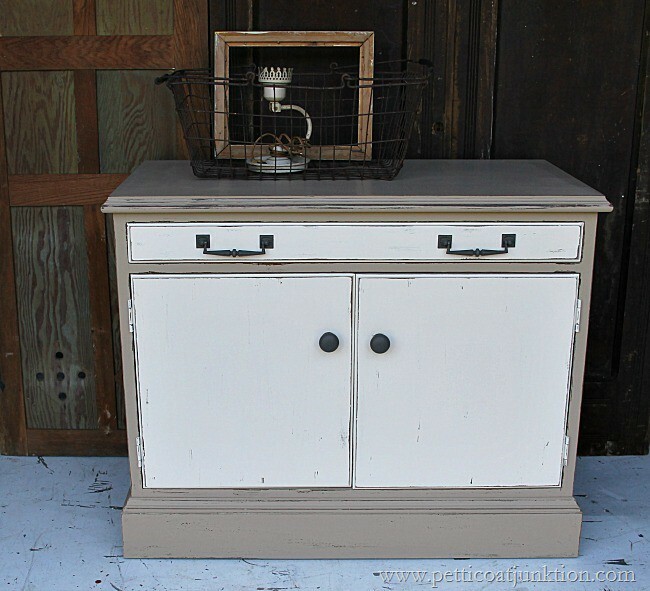 Milk paint? 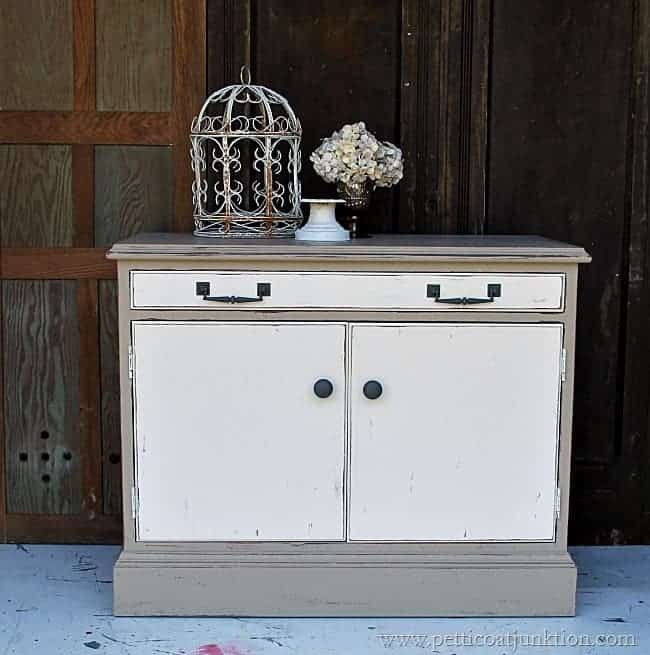 Is this chalk paint you used? Looks fantastic!!! No it’s Reclaim Paint. Thanks! Really like this piece, see above it’s called a credenza. could be small cupboard also. I’d sure use it in my kitchen. Like the gray you used and how you did the hardware. You did great job rehabbing it but then you always do. I with Chris no matter what it is called it looks great!! That’s I’m with Chris. STupid autocorrect! I’m glad your husband is doing so well. That’s a small credenza aka console and probably was part of a set of office furniture.